Aston Villa manager Paul Lambert thinks his daughter could have thrown a harder punch than the push which resulted in Christian Benteke being sent off against Tottenham. Belgium striker Benteke received a red card 25 minutes from the end of Villa's 2-1 Premier League defeat on Sunday for pushing a hand into Ryan Mason's face. 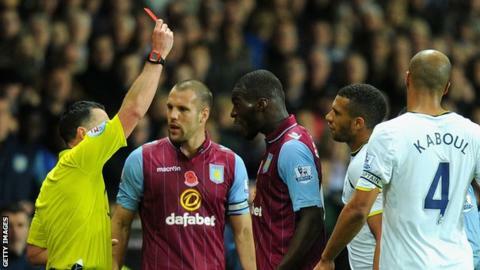 "You cannot condone what he did, but it is not like he threw a Mike Tyson punch," Lambert told BBC Sport. "My daughter can punch harder." Villa were leading 1-0 through an Andreas Weimann goal when Benteke was dismissed. Television replays appeared to show Mason pushing his head into the face of Benteke, who was making only his third start for Villa after six months out with a ruptured Achilles tendon. Lambert said: "He was provoked. If you go back a frame in the video, you can see the lad puts his head into Christian's face. I can understand what Christian's done, even though I can't condone it." Weimann's 16th-minute opener ended a Villa goal drought stretching back to 13 September, when Gabriel Agbonlahor scored in a 1-0 victory at Liverpool. Nacer Chadli and Harry Kane struck in the final six minutes to consign Villa to a sixth straight defeat, which marks their worst league run since 1967. But Lambert felt Villa's performance was much improved on the one that resulted in a 2-0 defeat at Queens Park Rangers last Monday. "I thought we were excellent throughout the game," he said. "OK, we lost but the red card changed the game. There were so many positives today but one disappointment. "We were up against a good side but I thought we looked like the team likely to score. The way things are going, sometimes things go against you. Performance wise I could not have asked for more. "Christian Benteke was showing great form, Tottenham could not handle him and it is disappointing with the red card."